The basic form of a national building typology is a set of example buildings which is used to demonstrate the possible energy savings by applying refurbishment measures. The pre-calculated examples are disseminated by brochures or by online information platforms. The primary target groups are house owners. Referring to the appearance and the details of an actual existing building proves the feasibility of the measures and creates the necessary confidence. The “Showcase Examples” can also be used in energy advice or energy certificate software as pre-defined datasets in order to show typical energy savings without entering all the input data necessary for issuing an energy performance certificate. The availability of the same set of buildings in software applications also allows an easy comparison of the software features by the users. Apart from the field of common information the showcase examples can also be used by key actors to present the impact of policies and measures in an illustrative manner. Please consider the TABULA Synthesis Report for more information about the displayed examples and further experiences in this field. 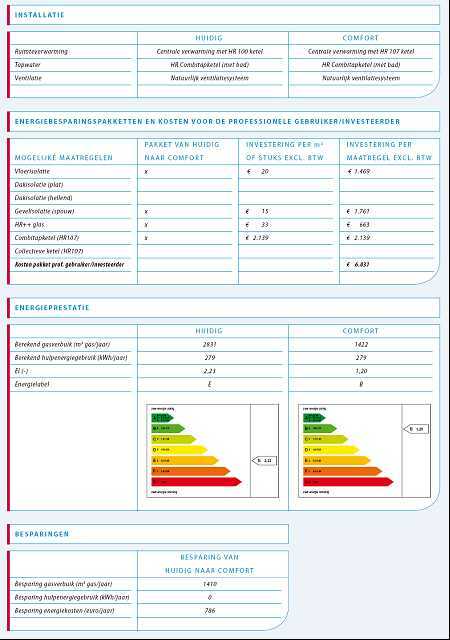 assessment of different strategies for the improvement of the energy performance, estimation of refurbishment costs, effects on future energy costs and rents.